FILE - A priests holds communion wafers after a mass at La Prairie in Lourdes, Sept. 14, 2008. Catholic churches in Colombia have donated a quarter-million communion wafers to congregations in neighboring Venezuela, where a food crisis has led to shortages of the holy bread. The Catholic diocese of Cucuta in Colombia said its members braved heavy rains this week to deliver the wafers over a bridge that connects the two countries ahead of the Easter holiday. Venezuela’s food shortages have affected churches’ ability to get wheat flour, an ingredient needed to make communion wafers used during Mass throughout the year, including Easter Sunday. Local news reports say some churches in Venezuela are dividing the communion wafers in half so that more people are able to take communion. La Croix International, a Catholic daily, said churches in the state of Mérida in the Andes had no altar bread for Mass February 25. 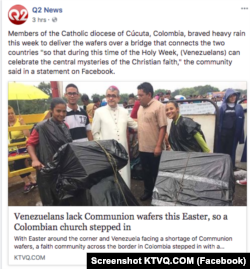 The Catholic Diocese of Cucuta posted about its recent donation of communion wafers to churches in neighboring Venezuela on Facebook, showing pictures of volunteers carrying large boxes filled with the wafers. Venezuela’s economic crisis, fueled by a decline in oil production, has led to shortages of many staple food items, including wheat, sugar, eggs and coffee.